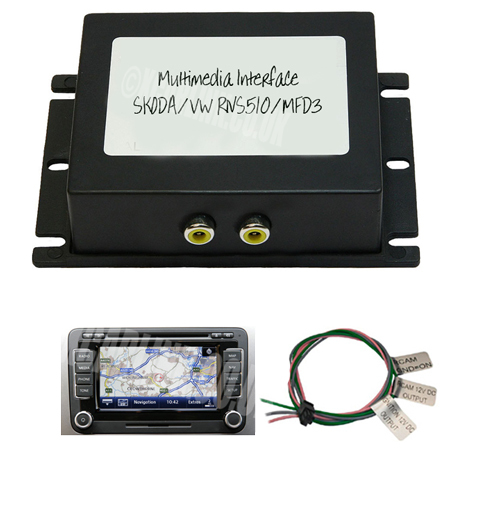 Multimedia interface for the connection of any video source to a factory fitted VW RNS510/MFD3 navigation screen enables you to connect any video device such as Rear View camera, TV tuner, Mirroring interface etc. This interface is designed for video only. Which is perfect for fitting a rear camera. Alternatively, audio can be connected to the RNS510/MFD3 system using our iPod or USB Interface. The interface connects via the original TV tuner connection on the factory radio and hence will not play video while the car is motion. To overcome this limitation a TV in motion interface is required, and can be added to your order at a discounted rate via the drop down menu option above. Please note that TV in motion is not required if you are fitted a rear view camera. Automatic switching to rear camera from OEM mode only works after coding/ Alternatively you can manually switch to the rear camera at any time via the RNS510 control button.